Copyright Ó 2008 Curl & Associates, Inc.
Curl & Associates, Inc. is currently working with the Village of Central City to evaluate and improve the sanitary sewer collection system. The sanitary sewer collection and treatment system was installed starting in 1962 using vitrified clay pipe (VCP), ductile iron pipe (DIP) and brick manholes. These materials were the normal materials used for this work in that time period and were very acceptable if installed properly. When the VCP is installed carefully and in alignment it will last for many years without problems. If the VCP is not installed with joints in alignment, the joints will leak. During dry periods, the sewage will leak out attracting the roots from trees to grow to the pipe for water. These roots will grow into the lines causing solids to plug the lines. As the roots grow, they will open the joints further and will eventually cause the lines to break, increasing the leakage and plugging problems. If the VCP is installed on unstable soil, the lines will settle, causing line breakage, leakage and plugging problems. During wet periods, these leaks will allow water to come into the sewer mains. This greatly increases the cost of pumping and treatment. These leaking lines will also create flows so high that the sewage can back up into homes and businesses creating clean-up expenses and dissatisfied citizens. The Village of Central City has been experiencing leakage problems and has asked us to evaluate the lines, pin point problem areas and suggest a means to reduce the leakage. The goals are to save operating expenses and reduce the environmental impact caused by the leakage, line plugging and structural failures. Curl & Associates, Inc. has utilized two basic methods to locate the problem areas. The first step is to force smoke into the lines, looking for smoke to surface through the ground, indicating the general location of the leaks. The sewer smoking will also locate connections to undesirable water sources such as gutter downspouts, storm sewers, and basement drains. The second step is to inspect these leaking areas using an internal camera running down the sewer mains to verify the reason for the leakage. line, pushing the old line out while pulling a new polyethylene line in place. This system still requires digging up and reconnecting the services. capability of the line is present. repair many of the brick manholes. We will then create plans, specifications and necessary IEPA permits for construction of a cost effective repair of the system. Smoke test showing evidence of a sewer service line leaking. 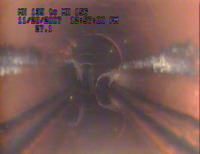 Smoke test showing evidence of an illegal downspout connection..
A picture from inside a Central City sewer main. 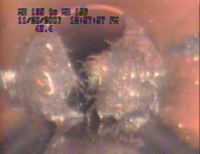 Root mass inside a sanitary sewer line.